Did you see him? He was in Leesburg this morning! 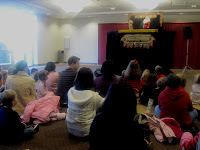 As part of the Childrens Performance Series, Kaleidoscope Theatre at Ida Lee, Rufus was our special guest this morning! Once a month, there is a different performer. My son and I try to go each month - it's special "Mommy-Devon" time; but this month, our friend Zavion joined us. Rufus is a brown dog with a red nose. He's been homeless, hungry, cold and in the rain, for some time. He was looking for some food to eat and a place to stay when we met him. Then, out of the blue, SANTA arrived! But, Santa did not believe he was a dog, as Santa had never seen a dog with a red nose. You see, Santa's dog is hot pink and has a purple nose, and so that is what Santa thinks ALL dogs should look like. To prove he is a dog, Rufus had to go to dog school, taught by a Banana! There, he learned important vocabulary like "ARF" "GRRR" and other such common dog language. In the process, we had some fun with letter sounds, and rymthing words. In the end, Santa learned an important lesson... things that make us different make us special, and we're all different. Santa offered Rufus some food and a permanent home, and dubbed Rufus the "Red Nosed Rain Dog" telling him to go find other special dogs that are out in the cold and rain with no food and no home... and to bring them all to the North Pole to live with them as one big happy family! It was a great story and we didn't feel bad about skipping preschool to go, since there were several good lessons in the story. The most important lesson of all: Our differences make us special. 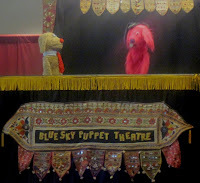 Thank you to Blue Sky Puppet Theatre for a great show today! Be sure to check out the upcoming schedule for the Kaliedoscope Theatre HERE; and we hope to see you next time.